Dr. Salim Thomas with Indira Gandhi. 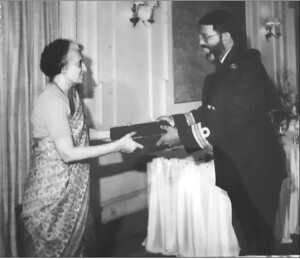 In 1981, Kerala newspapers hailed that it was a Malayalee, Dr. Salim Thomas, Indian Naval Officer Surgeon, that was selected as doctor-member of the historic first Indian Antarctic Expedition. Thomas studied in Lawrence School, Ooty, stood first, completed his medical degree and joined the Navy. He had lived all his life in Madras, that is Chennai, and continues to do so. His father, Kit Thomas, distinguished educationist, lived twenty years in Ooty as Principal of the Lawrence School and rest of his life in Chennai till his demise in 1993. Considering these, Tamil Nadu claims that it is a resident of this state that had the distinction of being a member of the first Arctic Expedition. This article is not to adjudicate on competing claims but to show that we have in our midst an interesting, many-sided personality who people want to claim as their own. We spent a morning with him to hear his thoughts on two areas of his intimate knowledge. After his medical degree, Thomas served in the Indian Navy from 1971 to 1986. He was selected by the Navy for a fully paid scholarship for studying surgery in the Armed Forces Medical College in Pune which he completed in 1979. Dr Thomas was chosen as a member of the first Indian Antarctic Expedition in 1981. For his participation, he was awarded the Nao Sena Medal for Gallantry in 1982. He took over management of the well known and much sought after Sishya School in Chennai upon his father’s demise in 1993. Dr Thomas is a senior consulting oncologist, consultant doctor serving on the Boards of medical institutions. He has taught surgery for several years. Doctor, Naval officer, Antarctic expeditioner, teacher of surgery, school administrator – with such a formidable background, there is much he can speak on. What fires one’s imagination, however, is his experience in the three-month Antarctic mission. A brief background of the Expedition is needed before we question him on details. The National Centre for Polar and Ocean Research, Ministry of Earth Sciences, Government of India initiated polar research in 1981 with the first Indian Expedition to Antarctica. This was an initial scouting team that was followed, perhaps based on its recommendations, by the construction of the Dakshin Gangotri Antarctic Research Base in 1983. As demand for equipment and facilities for the research mounted and as technology advanced, Maitri Base was built superseding Gangotri and still later by Bharti base in 2015, for research of atmospheric, biological, earth, chemical and medical sciences. The Antarctic Treaty was signed by India in 1983 committing to protect the Antarctic environment. The Treaty established freedom of scientific investigation and prohibited military activity on the continent and territorial ownership. We asked Dr. Thomas how he managed to win a place in this historic assignment, perhaps, leaving behind many other aspirants. It was the Prime Minster Mrs. Indira Gandhi’s pet project. When he could have explained his own special qualifications as having won this recognition, the answer he gave us was refreshingly honest. He joined the Navy in 1971 and was posted for Bangla Desh Operations. In September 1981, he was just ordered to report to Operation Dakshin Gangotri in Delhi. He did not have the slightest idea of what it was all about till he was told in Delhi that he had been selected as medical member of the 21-person expedition team. It came to him unsought. Before he could recover, he was put through a medical examination, which he passed without any hitch. While there was no psychiatry test to see if the candidate was mentally equipped to withstand the most exacting living conditions on earth, dental test and removal of the appendix were accorded priority! And that because there was no facility at the site for treating these problems. He did not have to undergo operation for appendix as it had been removed even when he was in school. From his response it seemed that he was not unduly elated over the distinction nor disturbed by the fact that he was going into the unknown vast icy expanse where several, from many countries, have died in earlier expeditions, unable to cope with the extraordinary stresses of the environment. There was no rush to the nearest phone to break the big news of selection as a member of the historic first expedition to the Antarctic nor taking leave to go back home to celebrate it. It evoked just an inland letter by post “to keep his father informed”. All that he remembers is his father pointing out the misspelling of the word “Antarctic” omitting the letter “c” after “r”! Explaining the preparatory training for team members, Dr Thomas recalls how they were sent for a week to the High-Altitude Warfare School in Gulmarg established by the Indian Army specialising in winter warfare. It was one of the highly rated warfare academies of the world. The team had to camp for the week on a glacier to understand the way to cope with “conditions somewhat similar to Antarctic conditions”. The training was for survival, environment ethics, handling emergencies and operating in a group. The team was equipped with gear from Norway as that country made the best equipment for polar conditions having the experience of sending many expeditions to the North and South Poles. It was interesting to listen to him reminiscing the two-week voyage. The Indian team left from the port of Goa on Dec. 6, 1981 by a chartered Norwegian ship, the 600-ton ice-strengthened Polar Star. The ship was equipped as an ice breaker and carried a crew of six and the team of twenty-one of the Expedition. The journey from Goa was routed through Mauritius to pick up equipment and other requisites. The duration of voyage helped gradual acclimatisation as the vessel slowly moved towards the colder latitudes. Reacclimatisation on the return journey was similarly a smooth natural process. The last three days of the voyage were very difficult as the vessel entered the “roaring latitudes”, as the 40-50 degree latitudes were known for strong winds and choppy seas. The vessel pitched and rolled making things acutely uncomfortable. The first sight of towering icebergs on either side was a relief from the turbulent latitudes. We were overwhelmed and awe-struck, he says. The vessel had to find its way through floating sheets of ice breaking them at many places to create passage and cruising deftly between the towering ice shelves on either side. A helicopter guided the vessel to its destination. Dr Salim Thomas is wonderful person who was my senior in school at Lawrence School Lovedale. I was in awe of him for the firsts he accumulated, besides the coveted Presidents Gold medal. We became friends in Chennai after I left college,He never once boasted about his achievements, he is a great surgeon and a wonderful person, many should follow.I must thank Madras musings for publishing this article in your paper.